The official opening of Grundfos Egypt's new branch in Alexandria. Grundfos Egypt has officially opened a new branch in Alexandria as part of the company’s efforts to expand its distributor network and service facilities across the country. 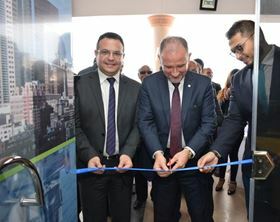 Ehab Eshaq, general manager of Grundfos Egypt, said that the opening of the Alexandria branch is designed to serve the company’s customers on the West Coast and in Alexandria and the Delta area and reduce the burden of transporting pumps to Cairo for maintenance. “The opening of the Alexandria branch is part of the company’s coordinated expansion plan that is expected to include branches and maintenance centres in other governorates in the upcoming period according to need,” added Eshaq. Eshaq praised customers’ support to date. He estimates that the company’s sales during the past year were LE350 million. Grundfos Egypt is aiming to increase sales by 10–15% to LE400 million by the end of this year. “The Egyptian market is a promising market that the company is keen to address strongly,” said Okay Barutcu, regional managing director for Eastern Europe, Asia, Middle East and North Africa at Grundfos International. Dubai-based Grundfos Gulf Distribution FZE is the regional headquarters for Grundfos for the East Europe, Western Asia and Africa Region.